Home › Replacing Missing Teeth › Thinking of Travelling Abroad for Dental Implants? With the attractive price that is often promoted by overseas dental practices it’s no wonder many people are tempted to travel abroad for dental implants and other forms of treatment. However, before you commit to this it’s important that you are fully aware of what to expect and what risks may be involved. The General Dental Council have put together a series of guidelines for people thinking of travelling abroad for their dental treatments. 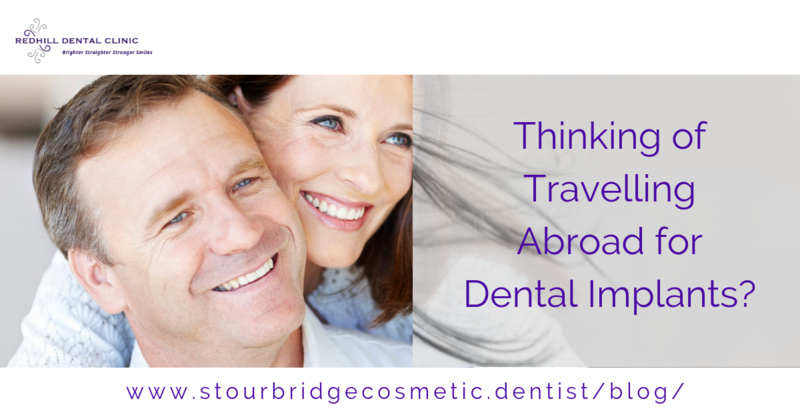 Travelling abroad for dental implants can be relatively risky compared with seeing a dentist in the UK. Dental implants often require a lengthy stage of preplanning and post placement care, this can become very difficult if you have to travel abroad to see the dentist each time. Whilst implants have a very high success rate they can occasionally be problems, again, this is much easier to remedy if the implants are placed in the United Kingdom. We’ve looked at the prices of dental implants abroad from a few different countries including the most popular ones Spain, Poland, India & Turkey. Implants seem to be around £500 per implant, when compared to the cost of dental implant in the UK this can often seen extremely cheap. We would however suggest you exercise extreme caution, one of the factors which affect the cost of the implant is the dental implant components themselves. There are well known and established dental implant component manufacturers such as Straumann, NobelBiocare and ITI to name just a few. The amount of research and historical product development that has gone into these implants is extensive and this comes with a cost. Dental implants are manufactured to extreme tolerances of fractions of a millimetre, whilst it is possible to mimic the recognised brands above, it’s not possible to do this making them cheaper and maintaining the quality. Many dental implant systems abroad use unrecognised or copy implant systems, this can mean that when you come back to UK if there is any problem that the dentist in the UK may not be able to help at all with any form of treatment on the dental implant. If these copy system companies have also gone out of business then it can make replacing the implant or indeed general maintenance virtually impossible. Our advice is always to stick with recognised implant companies and ensure you have certificates to prove that the dental implant components used are genuine. Decontamination in primary care dental practices (HTM 0105) – This is a health technical memorandum and audit tool to help with decontaminating reusable instruments in primary care dental practices. The Care Quality Commission – The independent regulator of health and social care in England. Providing care, treatment and support the needs people needs. The General Dental Council – The GDC regulates dental professionals in the UK, maintaining standards for the benefit of patients. The GDC will investigate any complaints made to them about dental professionals in the UK. This all means that your safety in the UK has a considerable amount of backing, support and regulation… You are strongly advised to check the same is true from any dental treatment you choose to have abroad. ‹ Did you know there could be a link between headaches and the position of your teeth?